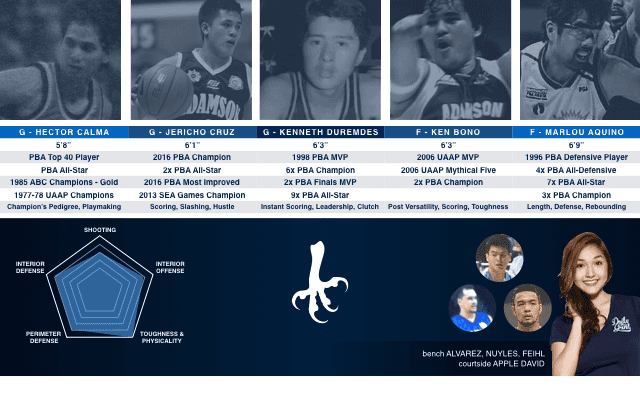 Despite not having consistent success in the UAAP in recent memory, Adamson’s sneakily impressive history may provide just enough firepower to become a sleeper pick in this fantasy league. Perhaps the most heralded Falcon in history, Kenneth Duremdes earns every bit his “Captain Marbel” moniker by plowing through the PBA with his natural scoring talents and on-court leadership, and gathering virtually every major PBA accolade in the process. Perhaps the perfect backcourt companion to complement Duremdes’s skillset is the equally gifted Hector Calma, who aptly enough, led Adamson to its first and only UAAP championship in history. Calma, despite earning numerous PBA accomplishments of his own, was best remembered for steering our upstart National Team to gold finishes in the William Jones Cup and the ABC Championships in the 80’s. Rounding out the roster would be UAAP legend Ken Bono, who, in his prime, could provide effortless offense in the paint alongside “The Skyscraper” Marlou Aquino, who in turn would carry more defensive duties. Dynamic guard and budding PBA talent Jericho Cruz could provide the energy, defense, and additional scoring to help space the floor. To utilize Aquino and Bono’s talents properly, Adamson would need to rely on pounding the post and rebounding like heck, since this team lacks frontcourt size and length. Solid ball movement and drives are necessary to spread the floor and create more opportunities for the forwards to operate properly. Despite recent wins in the UAAP tourney, NU has largely languished behind its rivals in talent and popularity. Hidden in obscurity however lies a treasure trove of basketball legends just waiting to be argued over by all-time basketball fan circles and middle-aged college reunion attendees. NU enjoys a particularly big lineup, with four men measuring 6’3” or higher. Manning the helm is fan favorite Bobby Ray Parks, Jr., who at an impressive 6’4” sees the floor reliably and commands attention with his unselfish demeanor and defensive acumen. He can work a two-man game with the legendary Jun “The Rifleman” Papa, who according to his loyal fans was the first coming of Stephen Curry—Papa was said to reliably shoot jumpers on fast-breaks just because he could. “Alaminos Assassin” Lordy Tugade could play off the ball and make inattentive defenders pay with his three-point accuracy. NU will benefit greatly from the uniquely talented stretch forward and Gilas cadet Troy Rosario, who at a towering 6’7”, can both operate fiercely in the post as well as shoot reliably from beyond the arc. Rosario, who led the Bulldogs to its first UAAP Championship since 1954, banners a modern basketball frontcourt that eschews brutality and physicality for versatility and spacing not unlike what Gilas icon and notorious Lebron-chaser Ranidel de Ocampo has done countless times for TNT. At the end of the day, NU will have to rely on the ever-glorious footwork and explosiveness from multi-MVP and chronic shake-and-baker Danny Ildefonso, who plugs in every major deficiency NU might have in quickness, length, defense, and inside offense. With the multitude of possible plays to execute and a variety of scorers from every angle, a game against NU might just as well be the most difficult to prepare for. 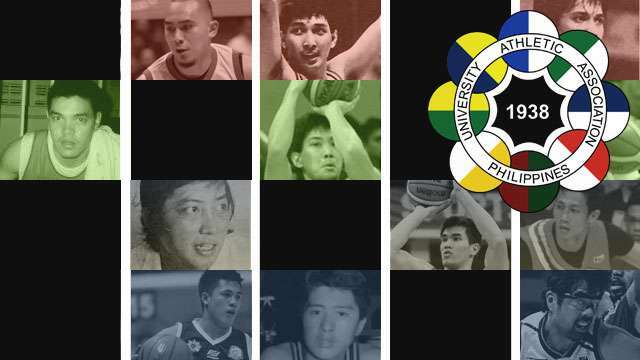 Much like DLSU, FEU’s winning tradition bestows more than a handful of incredible personalities that did nothing but elevate collegiate and professional basketball during their respective primes. Modern favorite and once-in-a-generation talent Arwind Santos banners an All-time frontcourt that also features former teammate and Gilas sharpshooter Jeff Chan. 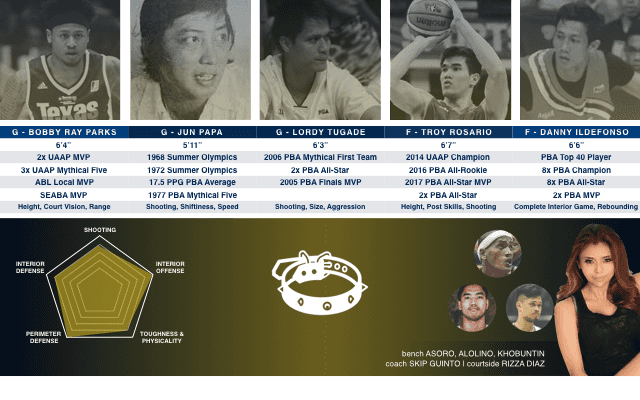 Santos’s uniquely balanced combination of elite length, leaping ability, all-around scoring, and propensity for blocks hasn’t been matched in the PBA for quite some time. Chan also has decent size to defend and shoot, leaving no apparent weaknesses for would-be attackers to exploit—except one. FEU’s most glaring weakness is its traditional lack of high-caliber centers. No offense to Aldrech Ramos, but FEU will need a more dynamic center to deal with the upgraded competition. Santos will therefore have to settle in at center and do his best impression of Draymond Green for the entire game. This will require another well-rounded forward to mask their deficiencies, and we believe Gilas vet Mac Belo can fill this role. Despite limited pro experience, Belo has since earned PBA All-Star status and several gold medals from international competition. We’re hoping he recovers from his recent injuries and again overwhelm opposition with his size, deceptive quickness, and toughness. 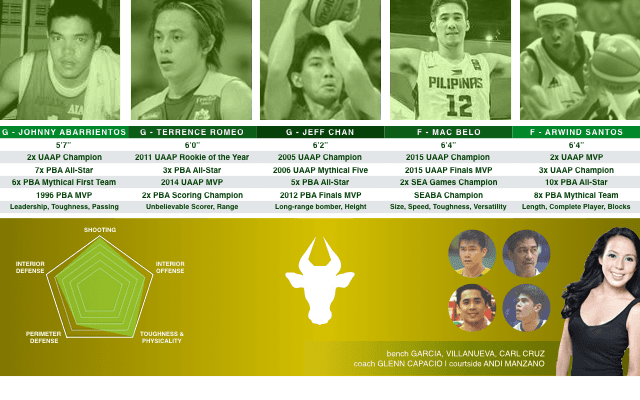 Of course, this conversation would not be complete without the mention of FEU’s tremendous backcourt. Johnny Abarrientos, rumored then to be our closest bet to the NBA, and perhaps one of the greatest playmakers in local history, will lead the team and effortlessly distribute shots to its scorers with his advanced court vision. And when all else fails: hide your wives, children, and shampoo bottles—it’s Terrence Romeo time. An outlying risk for this team would be the danger of Romeo ignoring his teammates to fly solo a bit more often than necessary. But then again, hey, it works. P.S. Yes, Marc Pingris actually played for FEU, but not much. He was largely a spectator during FEU’s run-ins with Mike Cortez’s La Salle squad, and soon after transferred to PSBA. We decided not to include him since he didn’t have a great enough impact there, much like Jojo Lastimosa for Ateneo. It’s time to go home, people. UE’s dream team may just as well be the local version of the Golden State Warriors. Armed with enough star-power to shake the very foundations of Philippine basketball, the Red Warriors have the perfect combination of size, skill, and spirit to dominate every inch of our basketball fantasies. 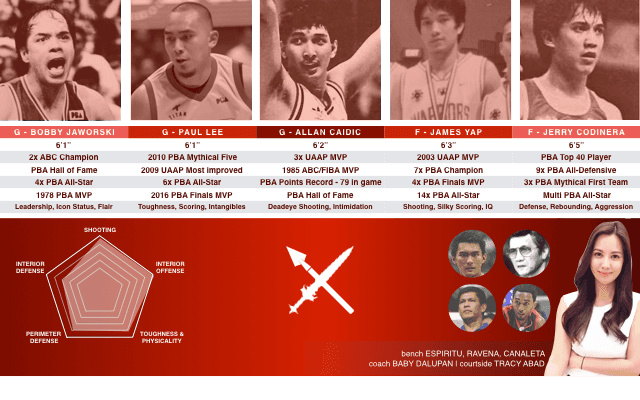 We are slightly bending the rules here by virtually including four guards in the lineup; but seriously, how can you not include James Yap, Paul Lee, Allan Caidic, and “Jawo” in it? Caidic, who still holds the PBA record for points scored—79 to be exact, should immediately force defenders away from the paint, allowing tough-as-nails wing Paul Lee and the silky smooth James Yap to attack at will; both can also score from beyond the arc at a decent clip if they choose to. Yap will probably have to play PF since he is the tallest of the bunch. Leading the team would be the heart and soul of Philippine hoops himself, the great Robert Jaworski, whose never say die attitude and knack for playmaking should help fuel an uptempo offense filled with showtime passes and daredevil cuts to the rim. “The Living Legend” can use his scrappy rebounding to help cover the gaping hole in the 4 spot. Should the UE Red Warriors opt to play their own style of NBA Nellyball or Seven Seconds or Less, they would need a capable center who can provide the needed defense without sacrificing offensive capability. Luckily, at front and center is the Jerry Codiñera, who will have to use his 9x PBA All-Defensive Team experience to gobble up rebounds and immediately throw half-court passes to jumpstart the league’s most dangerous offense. His reliable 18-footer will also serve to push his defenders further away from under the hoop. With UE, you get the whole package: a pinch of showbiz buzz, a dose of Tondo toughness, a rabid fanbase, an iconic Filipino catchphrase, and Tracy Abad as your courtside reporter. What else can you ask for?